The Corset is lined in cotton material for durablity and support, and protect the exterior fabric. A must have fashion accessories to your wardrobe. With 3" Modestry Panel at the Back. 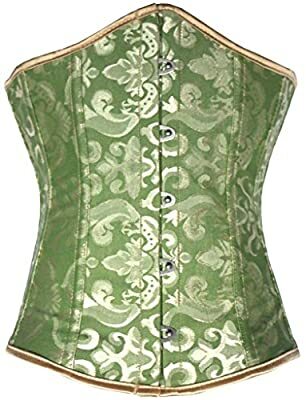 This underbust corset is designed for tight-lacing and waist cinching, and sizing is based on the corset completely laced shut. 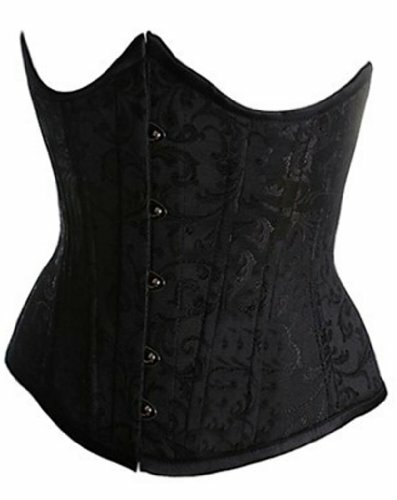 This corset should be ordered based on the measurement of your bust and waist in inches. Please Measure your Bust and Waist Size Before Order, and Choose the Right Size that Fit you. The Size is based on the corset completely laced shut. Click "Size Chart" next to the size selection and read the detail Sizing infomation of "Corset & Bustiers". Please note that we also have 4.5 inches Modesty Panel at the back for you to adjust the fitting. This Corset is Great for Waist Training, Cosplay Party, Halloween Costume Party or Fashion Corset. Boning: 2 Steel bars adjacent to the front busk, 14 Supporting Plastic Bones. Corset Length in Inches: Center Front:11", Side length: 9", Center Back Length: 10". Back Design: Lace Up, With 3" Modestry Panel at the Back. Comes with Matching G-String. The Corset is lined in cotton material for durablity and support, and protect the exterior fabric.